If you've set up online online enrollment periods, students can register themselves for courses for which they've met the prerequisites. You and the student's advisor(s) can also access her Profile > Registration view, which accounts for prerequisites, waiting lists, and registration locks. If you've enabled Waiting list over-enrollment in Academics > Settings > General, you'll have extra options for waitlisting students. 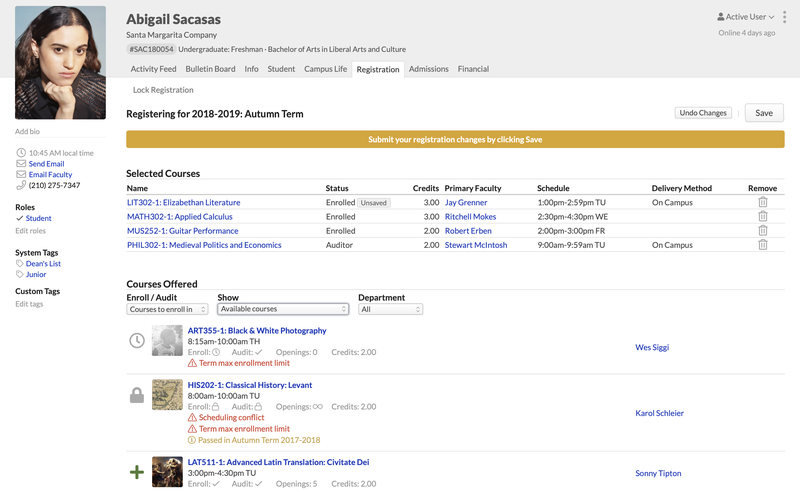 See this article for a list of the various settings that affect how course registration will work for you and for your students. Academic Admins, Registrars, and the student's advisor(s) can update her courses on the Profile > Student view. Academic Admins and Registrars can add individual students or import groups of students on the Course > Roster view. If the course's enrollment setting permits faculty, course faculty can also manage enrollment up until the course's add-drop date. Academic Admins and Registrars can enroll students using the Data Slicer. This article covers the latter four registration options. The Profile > Registration view appears when you've set up an online enrollment period that includes the student. It lets Academic Admins, Registrars, and Advisors submit enrollment requests on behalf of the student for courses—to enroll in, audit, or join the waiting list. Selected Courses are those for which the student has registered (or wishes to). Enroll/Audit: Toggle between courses which the student can enroll in or audit. Show Available courses with no conflicts: This is the default view. It shows courses from the student's program and campus for which she has fulfilled the prerequisites (or is currently enrolled in a prerequisite, corequisite, or equivalent) and with which she has no schedule conflicts. Additionally, if there is a term max enrollment limit, it shows courses which fall within that constraint. Show All courses: This shows every course offered in the term, whether or not the student can be registered for it. If the student has passed a course for which retakes do not count in earned credits, you'll see a notice that she's already passed it. This does not prevent you from registering her for that course. lets you register the student for that course. lets you request a spot for the student on the course waiting list. indicates that the student cannot be registered for this course because of a conflict with schedule, max enrollment, or unmet prerequisites. Using the drop-downs, choose whether to Enroll/Audit the student and which Offered Courses you'd like to see. Click next to the course you'd like to add. Click to request a spot for the student on the course waiting list. 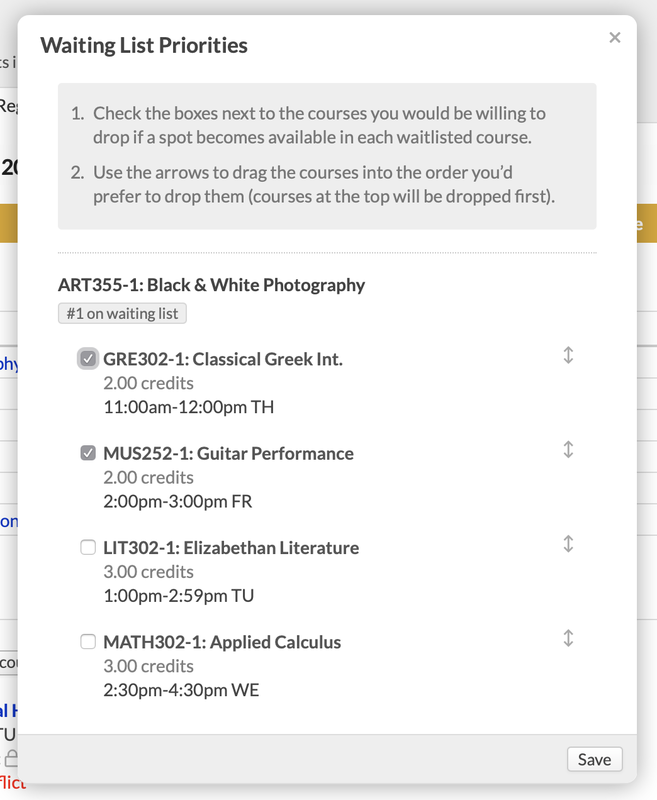 Offered Courses will switch back to show Available Courses. In all likelihood, new schedule and max enrollment conflicts will appear. If you've enrolled her in a course that is a concurrent prerequisite to another course, those other courses will become available for enrollment. If you enroll her in a course that requires enrollment in a corequisite course, you'll be asked to also add the corequisite to Selected Courses. If you're using enrollment agreements, Populi will email her a link to sign the agreement. If they're set up, tuition, fees, and other charges will be generated for the student on Profile > Financial > By Term. You can register a student in courses that conflict with her schedule or the term max enrollment limit. After saving these registrations, you can choose which courses the student will drop should a spot open up in one of the waitlisted courses. Click to request a spot for the student on the course waiting list. When you Save the registrations, you'll see the Waiting List Priorities dialog. Under each waitlisted course, check the radio buttons next to the courses the student would be willing to drop if a spot opens. Drag to put the chosen courses in the order in which the student would be willing to drop them (the top course would be dropped first, etc.). Populi checks to see if dropping GRE302-1 will resolve the schedule conflict. Turns out it won't. The student is dropped from MUS252 and enrolled in ART355. A similar process would happen for sorting out a conflict with the term max enrollment limit. In case the conflicts cannot be resolved by dropping any of the chosen courses, Populi will drop the student from the waitlisted course and then repeat this process for the next student on the waitlist. On the Profile > Student view, you can add and modify courses for any term using the Courses panel in the right column. This option lets you completely bypass prerequisites, meeting time conflicts, and enrollment limits (although you will receive friendly notices indicating when you do so). Click edit next to Courses. Click the arrows until you're in the correct academic term. Begin typing in the search field and select the course from the results. You can register the student as Enrolled or as an Auditor. Edit the enrolled date, if necessary. Repeat these steps as often as you wish. Click to delete a course (this removes the course from the student's file altogether; use this option only to correct mistakes, and not, for example, to withdraw the student). 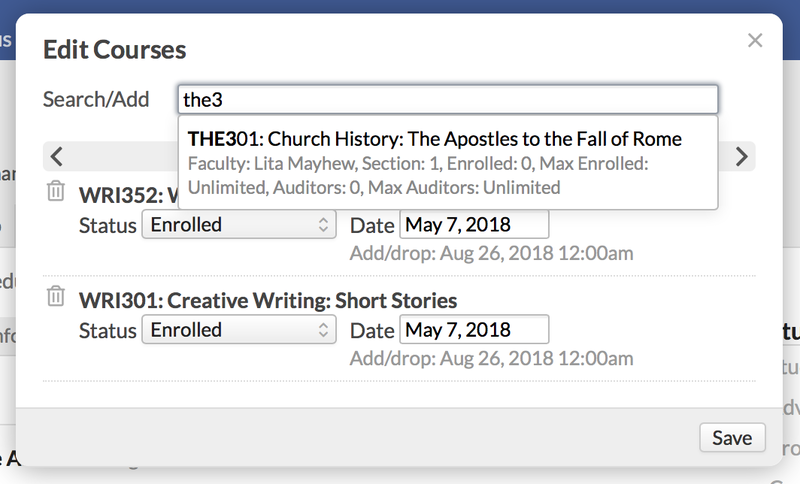 You can add students to courses by going to the Roster. It lets you add students both individually and by importing groups of students from other courses. The roster gives you the option to bypass enrollment requirements (prerequisites, et. al.). Click Add students and select Add students by name. Click Add students and select Import students from another course. You can add students to courses by going to the Data Slicer. It gives you the option to bypass enrollment requirements (prerequisites, et. al.). Run or load a report in the filter tool. Click Actions and select Enroll Students. Select the term in which you wish to enroll these students. Check the students you wish to register in the course. Choose whether he will enroll or audit the course. If it's a cross-listed course, select the course. If necessary, update the date. 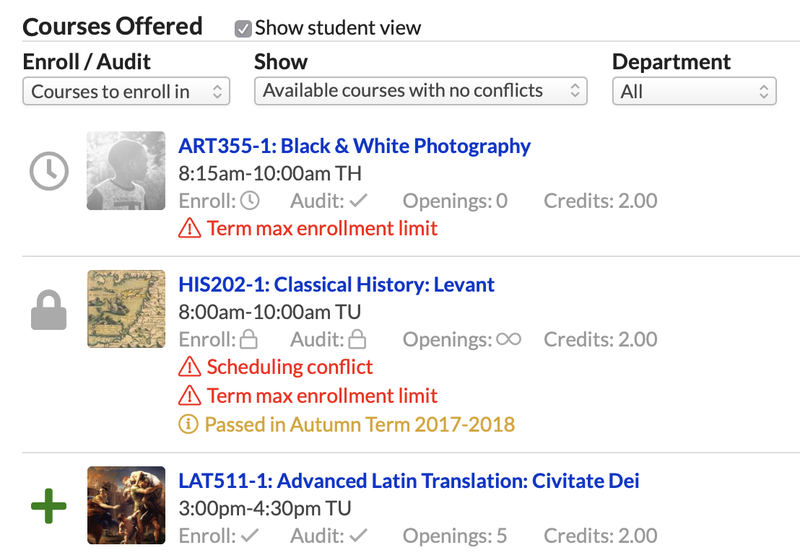 When registering students using the edit option on their profile, does it show when courses conflict in time? I get the notification for prerequisites not being met, but I haven't seen anything about conflicting times. No, there isn't a notification about time conflicts when you use the Profile Course Selector. Those notifications are present in Course Rosters and the main Registration screen. It may be that they need to be added to the Profile, as well. We'll see about that soon. Are we able to mass register students for a course? For example I need to enroll all freshman in a required course.